Collard jug - 5¼" (133 mm) high. Honiton is a beautiful town in Devon. Before the days of motorways it was on the main road from London to Cornwall, and in an ideal situation to attract visiting and passing tourists. Honiton Pottery dates back to 1881, but the early days are not well documented. Charles Collard set up his pottery in the High Street in 1918. Collard was already a well known figure in West Country pottery circles. He had previously owned the Crown Dorset Art Pottery in Poole, Dorset. 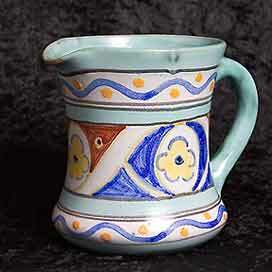 His wares were decorated over a white slip, which was already glazed, and had a strong resemblance to Poole pottery. Production steadily increased, and reached a peak in the 1930s. Collard's daughter, Joan, became a partner in the company. She decorated, and was host to visitors to the works. In later years she became president of The Honiton Pottery Collectors' Society - don't miss their web site! In 1947 Collard's sight was failing - he was seventy-three years old - and the pottery was sold to Norman Hull and Harry Barrett. Charles Collard lived to the very respectable age of ninety-five. The company ceased trading in 1997 and the name was sold to Dartmouth Pottery.